Today, as the world is turning out to be more digitalised the method of teaching and learning is also turning out to be digitalised. People look for everything which is digitalized rather than going on with traditional methods. Online education has its own benefits. You can just check for the college you want to pursue a degree from or check for the colleges in a place where you wish to study. For instance, if you wish to study in Arizona you can just look for the best online colleges in Arizona. This can be considered as one of the boons of online education as you can get a degree from anywhere you wish to. Why education in the USA? When the topic of education in abroad comes, most of the students prefer the USA. This is basically because of the wide job opportunities US offers especially, for the young graduates from the US itself. Apart from the education and job there, people also prefer the standard of living presently in the United States. The education in the US is very productive and is most practical and this helps students stay more focused on their studies and also helps them understand the concepts easily. Apart from this method of teaching, they also help them to work on practical projects. This might be in the form of a part-time job or it can be as an internship or even an academic project. Such projects done by the students can later be considered as one of the projects taken forward for the future benefits. Students also prefer the US because of the wide variety of financial aids it provides for the students. There are financial aids given by the colleges itself. For example, UTA financial aid is given by the University of Texas at Arlington. There are many other colleges also which offer financial aids based on different categories and different abilities of the students. Apart from the college financial aid, there are different organizational and also different governmental financial aids in terms of scholarships, grants and educational loans. There are a lot of career opportunities available for people everywhere and any course they have pursued. But, mostly they don’t know about those job opportunities. People usually go for online studies when they are already working or can’t go to college otherwise but want a degree. There are people who started their career just with their bachelor’s degree. Such people go with online studies for pursuing their masters along with continuing their career. There might be even people who directly entered their career life without a degree. For such people, online education is a great platform to regain something which they thought they had lost. There are wide career opportunities also available after online education. When you go for an online education you can select any university or college you wish to attend, without worrying about the traveling or stay in that place. So, when you have an option of selecting any college you can definitely go for the best colleges available in the desired country with the best education system. 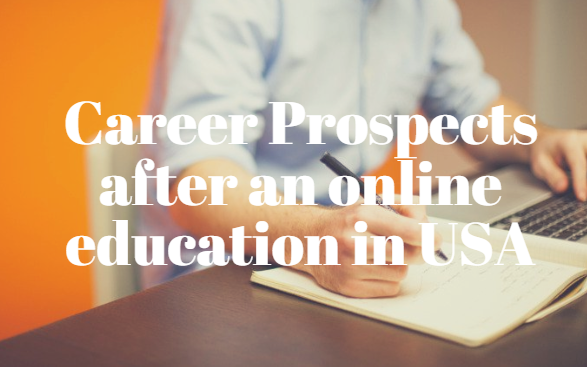 There are many colleges which provide online education and also there are many students who prefer universities in the US. With such great demand for education, the job opportunities also gradually increase. Mostly what companies look for is a student who has graduated from the college which has accreditation to well-known accrediting agencies. As almost all the colleges which have the facility for online education are accredited to the US Department of Education recognized accrediting agencies. This increases the chance of them being considered for the job.